Our ISO 17025 accredited supplement and food testing laboratory in the USA specializes in analytical testing of supplements, natural products and food. Our team of experts can assist with all your food, nutritional supplement, functional/nutraceutical foods and ingredient testing requirements, including microbiology, molecular biological, botanical identification and product testing, contaminant and adulterant risk management, chemical and biochemical testing of active ingredient analysis, nutritional analysis, shelf life testing of supplements, label reviews/validation, allergens, contaminants, method development, supplement product services, and cosmetics and natural cosmetics analytical services. We provide accurate results in fast turnaround times to local, regional and international clients. The accurate and reliable detection of allergens ensures the safety and quality of your products and processes, verifies food properties for labeling, and ultimately safeguards your brand image. From our state-of-the-art laboratory facility, our world-class technicians use cutting edge technology to accurately determine the presence of allergens, even at very low levels. Our laboratories can test for the majority of allergenic ingredients as listed in the Food Allergen Labelling and Consumer Protection Act of 2004 (FALCPA) on the provision of food information to consumers. We provide analytical method development on multiple platforms specific to your testing requirements. We offer in-depth scientific and technical expertise in analytical chemistry, biochemistry, plant biology, microbiology, food and pharmaceutical science for the perfect solution to your analytical needs. Increasingly more biologically and pharmacologically active natural ingredients are used in a variety of products ranging from dietary supplements to consumer health care products. Regulatory and consumer advocacy demand increasingly rigorous analytical testing and regulatory compliance. We can meet your needs with our extensive expertise and experience in natural botanical chemistry and chemical analysis of natural ingredients and products. Adulteration of herbal and nutritional products and key food ingredients require advanced testing to ensure both purity and safety, while maintaining the regulatory compliance of your products. We can support you through our advanced analytical chemistry tests of product purity and potency. 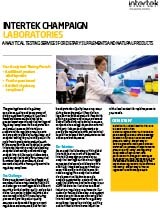 Intertek's state-of-the-art laboratory is equipped with analytical technologies for both raw ingredients and finished products by a range of analytical tests for trace contaminants and adulterants. Our laboratories can provide the analytical tests using either published (e.g., USP, AOAC) or cGMP validated methods in compliance with regulatory and client requirements. The following are examples of the range of contaminants and adulterants that may lead to product failure or non-compliance: Heavy metal contaminants, pesticides contaminants, organic solvent residues, antibiotics residues, restricted chemicals in packaging materials, food allergens and natural microtoxins. Intertek can help you mitigate these risks within dependent testing. The increased use of nutritional ingredients and other active chemicals in functional foods and sports drinks demand rigorous analytical tests for label and safety claims. We offer an extensive testing experience from product development and label claims to quality monitoring. The complex formulation of nutrients (e.g. vitamins and minerals) in diverse products presents challenges in their accurate determination. Our expert analytical chemistry testing of vitamins and minerals uses highly sensitive techniques in accordance with recommended methods including USP, AAOAC, and others. Our world-class specialists carry out microbiology testing for the full range of potentially harmful food-borne micro-organisms, including pathogens like Salmonella, E.coli and Listeria, along with spoilage organisms such as Yeasts and Molds. Our team of experts can guide you through the wealth of regulations so that your customers, products and brand are protected. Natural and nutraceutical products are an extremely diverse group of nutritional supplements. Many of these natural ingredients are complex in chemistry and less well characterised than conventional active pharmaceutical chemicals. The formulation of nutraceutical products has become more complex in order to meet the needs of specific health conditions. Our laboratory has extensive experience in the chemistry of natural products. Specifically, our focus has been on research, identification and quantification of the various secondary natural and synthetic compounds by a variety of key techniques such as LC-MS/MS, GC/MS and HPLC. Product stability is a critical attribute in the product life cycle of nutritional supplements, functional foods, cosmetics and OTC products. We provide product shelf life and stability testing in accordance with industry and regulatory standards. Our experts can offer a customized service which is tailor-made to the composition of your products, storage and packaging. Download our Champaign Food Services factsheet for further information.